On to more important matters: secondaries. This is a surprisingly difficult category to rank. There are things to like about all four secondaries in the division, and a fair amount of change from 2017 to try and project. Numbers in parentheses represent 2017 rankings, usually by DVOA. Jourdan Lewis was great as a rookie in 2017 (Cowboys 8th vs slot WRs) and should be able to lock down the slot. Cutting Orlando Scandrick and presumably sending Anthony Brown to the bench can’t really hurt this team, as the Cowboys were brutal defending passes to the outside on both the right (21st) and left (25th) sides, and struggled versus No. 1 (21st) and No. 2 (23rd) WRs. Chidobe Awuzie was a promising prospect who battled injuries as a rookie, but could be good. Byron Jones can’t possibly be worse than he was as a safety, and Jones at corner has the added benefit of moving Brown to the bench. Brown stinks, but you could do worse for depth (see: Giants). The safeties though? They are terrible. In 2017 the Cowboys got eaten up by TEs (25th) and RBs (28th) in pass defense and weremediocre defending the deep ball (19th), particularly the deep middle (31st). Kavon Frazier actually saw about 20% of snaps as the fourth safety in 2017, but he stinks too, and Jeron Johnson is on his fifth team in four years. Outside of Lewis, there isn’t any area where the 2017 Cowboys were good in pass defense. Two new starting outside corners could certainly change that, but neither guy has a track record you can bank on and the safeties still can’t cover anyone. Janoris Jenkins missed half of 2017, but he is a high-end talent at CB and should be fine in 2018. Outside of him though, this group is worrisome. Eli Apple was probably the worst starting CB in the NFL in 2017 (Giants ranked 32nd vs No. 2 WRs, 28th on passes to Apple’s side). The only area the Giants were actually strong in 2017 was defending the slot (6th), and they cut Dominique Rodgers-Cromartie. Go figure. Astonishingly BW Webb has been on eight teams in seven seasons, and once again nobody has ever heard of any of the Giants depth players. Darian Thompson was half-decent in 2017 and the Giants did a pretty good job against RBs and TEs in pass coverage (15th in both categories), but were vulnerable to the deep ball (25th). Thompson will be demoted to the bench as some guy named Curtis Riley looks to have the inside track on a starting spot. Landon Collins was a legitimate DPOY candidate in 2016 but he seemed to regress (particularly in coverage) in 2017. Ultimately I can’t hate a group that has top end talent like Jenkins and Collins, but I can’t like a group that surrounds them with nothing. I do think James Bettcher is a good coach, so we’ll see if he can get creative and help this unit (particularly Collins). This secondary was seriously good in 2017. The Redskins were 6th in the NFL by passing DVOA and the weakest link in their secondary from last year, Bashaud Breeland, is gone. Unfortunately so is Kendall Fuller, and the Redskins were outstanding the slot in 2017 (4th). That leaves a big hole in the secondary and it’s anybody’s guess how Fabian Moreau and Quinton Dunbar will look filling it. Josh Norman remains the best CB in the division by far (5th vs No. 1 WRs). The safeties also exceeded my expectations in 2017. DJ Swearinger had times when he looked silly in coverage (mostly against the Eagles), but overall Swearinger and Montae Nicholson were one of the better safety tandems in pass defense in the league, though they did struggle with the deep ball (20th). I think I have said this about the Redskins in every article I have written this year, but there are no glaring holes here. Depth is a little concerning, particularly at the CB position, but overall this should be a good unit again. 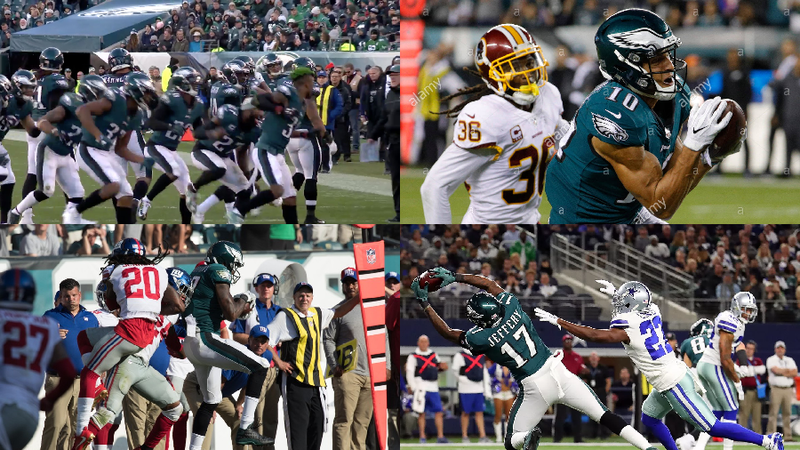 The last time the Eagles secondary took the field in a real game, they were getting torched by Tom Brady in the Super Bowl (which the Eagles won, by the way). Two weeks before that they suffocated the 3rd best passing offense in the NFL, and the week before that the 10th best. That inconsistency typified the Eagles defense in 2017. They ranked 5th in overall defense and 8thagainst the pass, but 31st in variance, meaning most weeks you were getting a defense that was one of the best in the league, but when they were bad, they were dreadful. The Eagles return Jalen Mills and Ronald Darby on the outside. Both of these guys (Mills in particular) have been vulnerable to the deep ball on double moves, but that aggressiveness is also why they have been so good shutting down the shorter routes(7th), particularly on the outside (6th on short left, 6th on short right). The only major change in this unit is Sidney Jones (likely) replacing Patrick Robinson. Robinson had a strong year for the Eagles last season, so that is an area to watch. Rasul Douglas filled in nicely when Ronald Darby was hurt in 2017. I think the Eagles have the best starting safety tandem in the NFL. Malcolm Jenkins does everything for the Eagles from playing man on TEs (17th) or RBs (10th) to playing single-high to blitzing. And Rodney McLeod does a good job providing the umbrella coverage that prevents the Eagles aggressive CBs from getting torched too badly (9th vs deep passes), most weeks anyway. This is a two-team race at the top, but I gave the edge to the Eagles over the Redskins due to better safeties and known quantities at CB.